Any hint on the pricing yet? I'm normally not a big fan of DLC but i think the Cutlery Shoppe orange is one of the best colors for a black DLC knife. I'm also really loving the stonewashed finish on my Maxamet Para 3. Really interested how stonewashed XHP will look with orange. Is the Cutlery Shoppe orange g10 the same as the rex45 burnt orange? Didn't vote. Not interested in any of the options. Thanks for informing us of your non-vote. Many of us were extremely worried about this. I don't think so. I think the Cutlery Shoppe orange is brighter than the burnt orange. If you are talking Para 3 or PM2 in REX 45 they are the same. Some of the other knives that are custom are not. This. It is much brighter. You can check their current and sold out exclusives to get an idea of the color. I'm holding out for a couple cutlery shoppe runs. 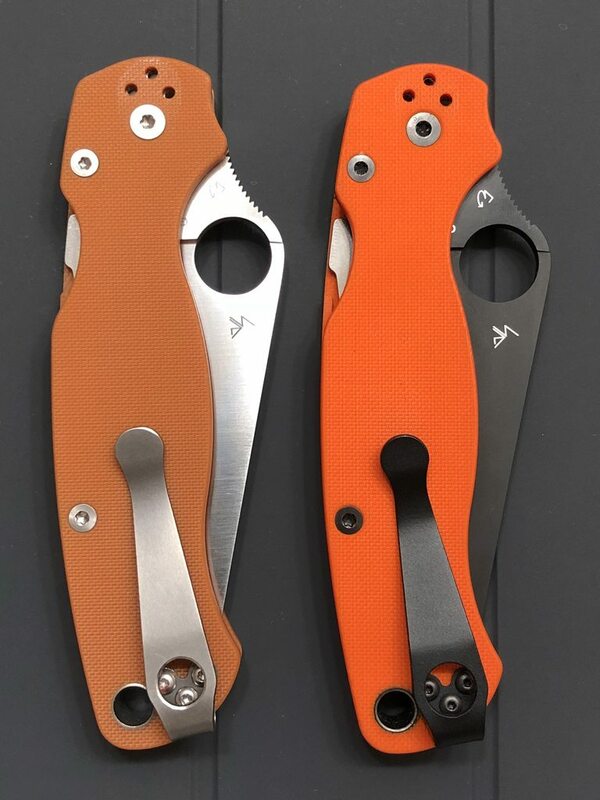 I missed the orange/black PM2, seeing that knife is probably what really drew my attention to spyderco knives a few years ago when I was just getting into knives. I need a manix and a Para 3 still in my collection and I'm debating which one to get in orange. Bump. Any updates on drop date? Stonewash for me. I love orange and I love DLC, but I don't love them together. hmm, that's a dead ringer for a creamsicle... not the orange I had hoped for, or maybe just terrible white balance? I'm gonna have to see a real product shot to decide if I like that G10. "We thought they were going to be stonewash but they’re satin." "We should be setting a drop date next week. We will post a couple days in advance." So it looks like both versions will drop at the same time and soon! Get your wallets ready lol. And the plain version is not stonewashed . I was looking forward to more stonewashed blades, love it on my Maxamet Para 3. I'd imagine they use the same G10 as they did all along with their other exclusives. Smartphone photos make colors look bad often. Thanks for the heads up...I'm ready for both! looking at the pics it looks like the satin is the same as the satin finish on the S35V Para 3. Which, IMO, is really nice. Good spot. It really does look the same. I never really looked into the S35VN model cause the steel and scale color don't interest me. Thought it would be the same finish as the PM2 in that steel. I wonder how the satin blades take scratches though. Anyone got experience with it? I like stonewashed because it looks nice and really lowers the bar to start cutting things with your new knife cause it is already scratched up. I'd even like em more scratched/heavier stonewashed than the Maxamet is.